As the holiday season rolls around, it can easily catch us off-guard or inspire panic. What can we possibly get our loved ones that we haven’t gotten them before?! How can we express how much those gift recipients mean to us without resorting to gift cards, cash, and socks? 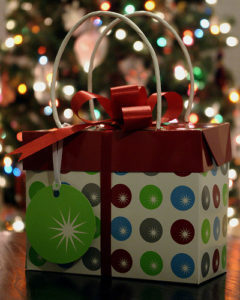 One easy and meaningful way to get out of the gift card rut is to try personalizing your gifts. Throwing in a little customization makes presents special and one-of-a-kind. At LazerDesigns, we specialize in one-of-a-kind gifts which inspire surprise, joy, and sometimes tears — the good kind, of course! 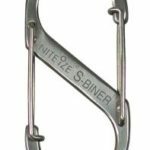 – Looking for a Christmas gift for a master griller? Take a look at our elegant 5-piece bamboo BBQ set! It comes complete with a BBQ fork, tongs, knife, basting brush, and spatula with built-in bottle opener. Just customize the design with your own information, or send us your unique art or message. 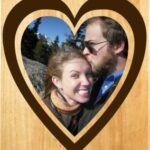 – For a unique and impressive Christmas gift for a wine enthusiast, try a custom engraved bamboo wine box. 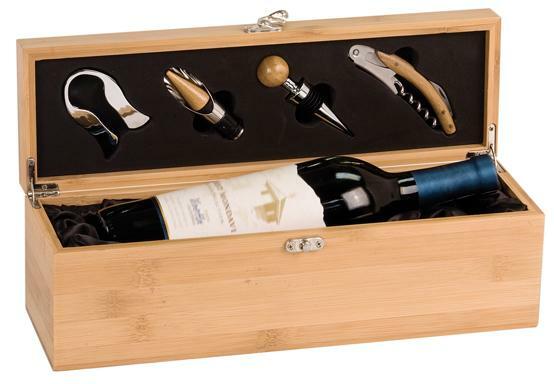 The box includes a foil cutter, decanting pourer, stopper, and corkscrew. Plus, you can add names, logos, clip art, or a custom message for no extra charge. 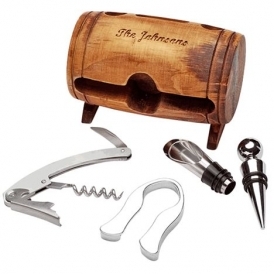 – Or, our personalized barrel wine set with tools is a great Christmas gift idea for wine lovers. Just like the bamboo wine box (and like so many of the best gifts), it already includes all the tools you’ll need. Just add wine! – For a camper or an upcoming celebration, get ahead of the gift-giving curve by ordering a personalized leather flask set. 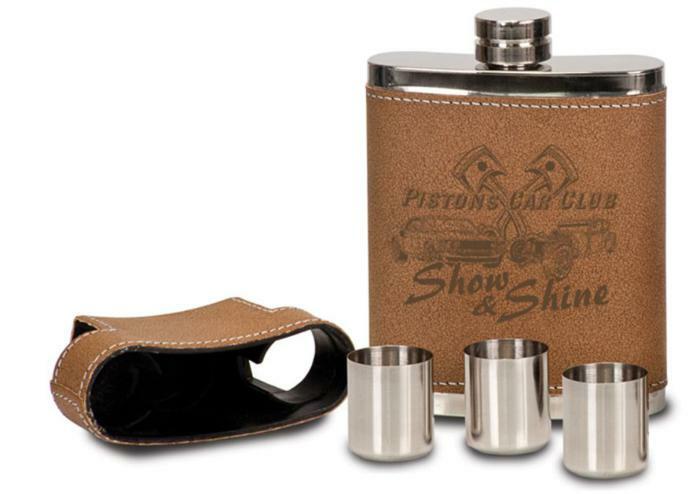 The cap holds three handy shot glasses, while the leather sleeve can be customized to make it a portable-but-personalized Christmas gift. – Try giving your favorite cook a quality Chef’s kitchen gift set. This set comes with a large Totally Bamboo cutting board and ultra sharp chef’s knife. Plus, the whole set can be engraved, and comes in a Jute Fabric Bag for easy and attractive gift giving. – Present your favorite camper with a personalized fire starter and rescue knife gift set. 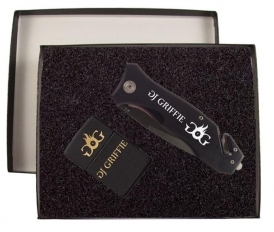 The set includes a genuine Zippo lighter (with Zippo’s famous lifetime warranty) and a black rescue knife, both with the engraving of your choice. – Looking for a gift for a guy in your life this Christmas? Try our tough, tactical, and customized rescue knife. One of our most popular items, this rescue knife features a seat belt cutter, glass breaker, and pocket clip. The knife can be engraved on either the blade or the handle, giving you plenty of space to personalize. – Stay ahead of the Christmas gift-giving rush and order an engraved Leatherman Skeletool for your tool man. T he Skeletool comes with wire cutters, pliers, bit driver, bottle opener, and a partially-serrated knife. This variety of uses will certainly come in handy when trying to break into the various kinds of packaging on Christmas morning. 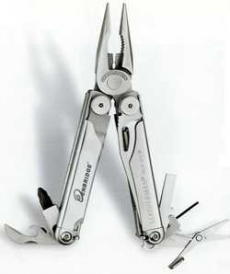 – For a Christmas gift for that person who always gets the job done, try a custom engraved Leatherman Wave multi-tool. The Wave comes in your choice of stainless steel or black oxide finish, and includes tools including (but not limited to) pliers, scissors, ruler, saw, bit drivers, screwdriver, wire stripper, and wire cutter. What more could your favorite handyman need? – Shed a little light on someone’s Christmas this year by giving a personalized LED flashlight. 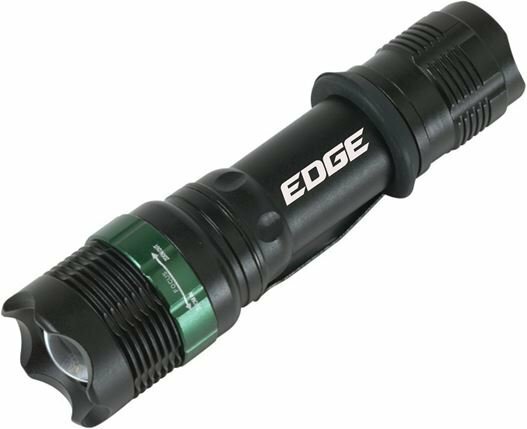 The Cree R2 LED Tactical Flashlight is rugged and unique, with an incredibly bright and energy efficient beam. This flashlight comes with a stainless steel belt clip, batteries, and a black gift box for easy presentation. – Give a gift that’s both elegant and practical with our personalized decorated grip hunting knives. 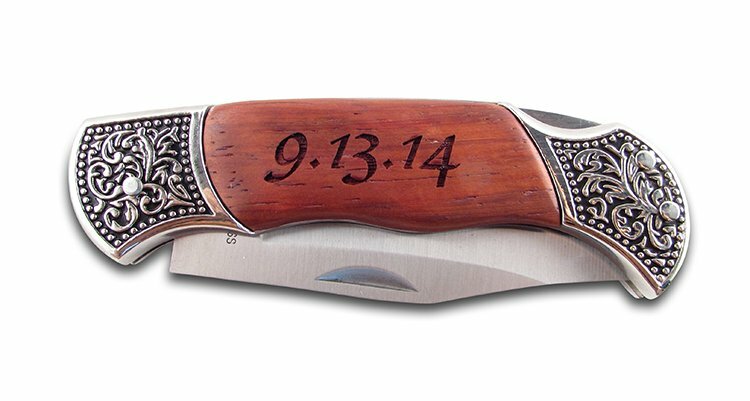 These knives pack a lot of elegance into a small package, with engravable rosewood handles and decorated bolsters. – Put a twist on ordinary travel mugs! 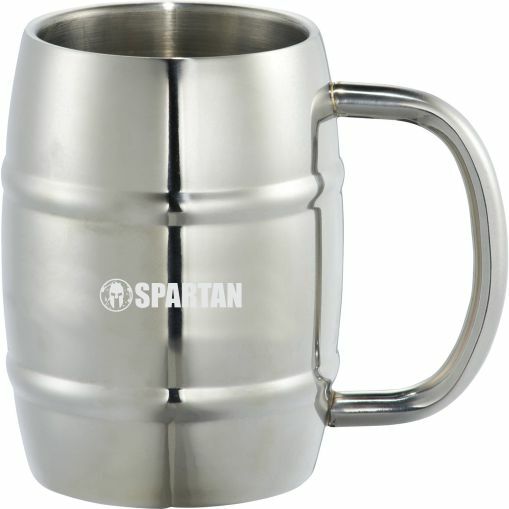 Our customized stainless steel barrel mugs are sure to be a hit this Christmas. With 14 oz. of space and a double-walled structure, you can fill this guy up with either hot or cold drinks. Have it engraved with the recipient’s name, and everyone else will always know they can look but not touch. 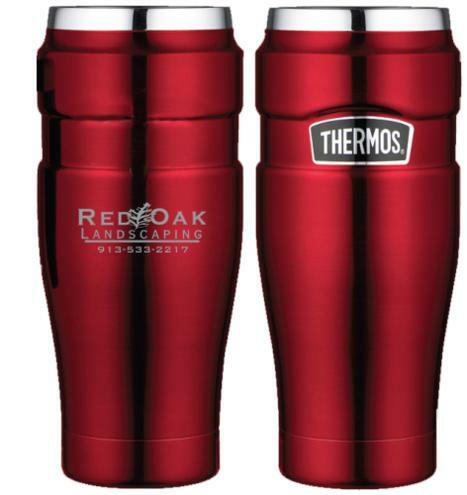 – Give the gift of a caffeinated commute with a customized 16-oz Thermos travel tumbler. The Thermos Stainless King keeps drinks hot for 5 hours or cold for 9 hours, so whatever your recipient likes to drink will be the perfect temperature for quite some time. 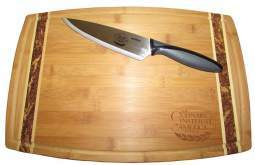 – For the foodie in your life, try a customized bamboo cutting board. The Totally Bamboo 11×15″ Martinique Board gives you plenty of space for all your slicing and dicing, plus it looks classy while in action. 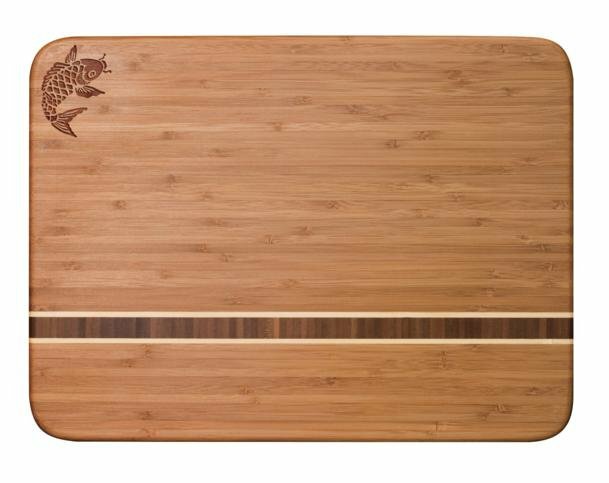 Plus, bamboo is naturally microbial and easy to maintain, so bamboo boards make great gifts. 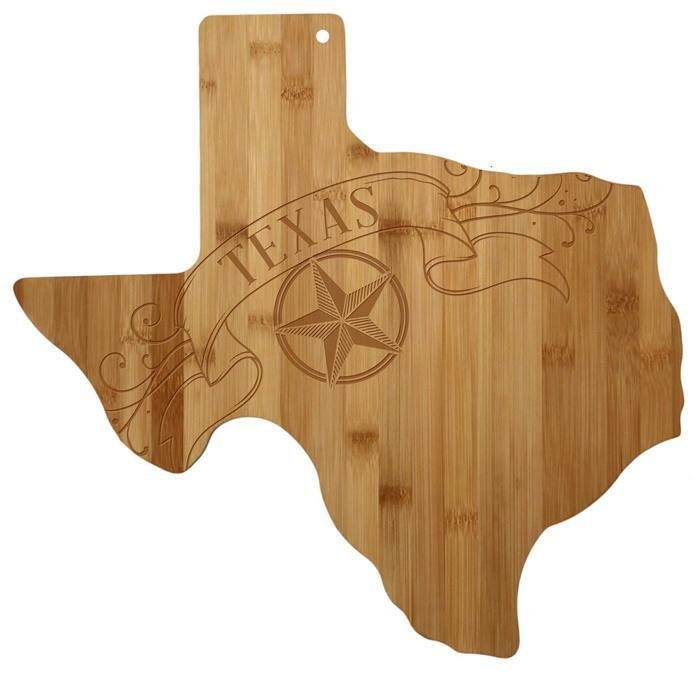 – Or, go for something a little closer to home with a state-shaped cutting board. Totally Bamboo state-shaped cutting boards are great personalized Christmas gifts. You can engrave one of our pre-made designs and make it your own, engrave a heart over a special town, or create your own design with text and artwork. There are so many possibilities, and they all result in an incredibly special and unique Christmas present. If you’re still keeping an eye out for ideas, check out our other options for personalized Christmas gifts!